The Cubs just needed to win a game. And so they did, shutting out the Dodgers 5-0 Saturday night to earn a trip to the World Series for the first time since 1945. That was so long ago (how long ago was it?!) that this marks their first ever NLCS win as the World War II-era pennant was a simple matter of winning one of the two 8-team leagues. Clayton Kershaw lasted just five innings. He gave up five runs (four earned), including dingers by Willson Contreras and Anthony Rizzo, with an extra-base hit in every inning. Javier Baez continued his case for a tagging trophy, turning a double-play ball into a highlight. In fact, it’s possible his defensive prowess has gone to his head just a little. Bless you, Rizzo. But the real story of the night was Kyle Hendricks. The fringy prospect cracked the rotation in 2015 as a capable fifth starter but quietly posted a Major League Baseball-leading 2.13 ERA this year. I know, I’m as shocked as you are. 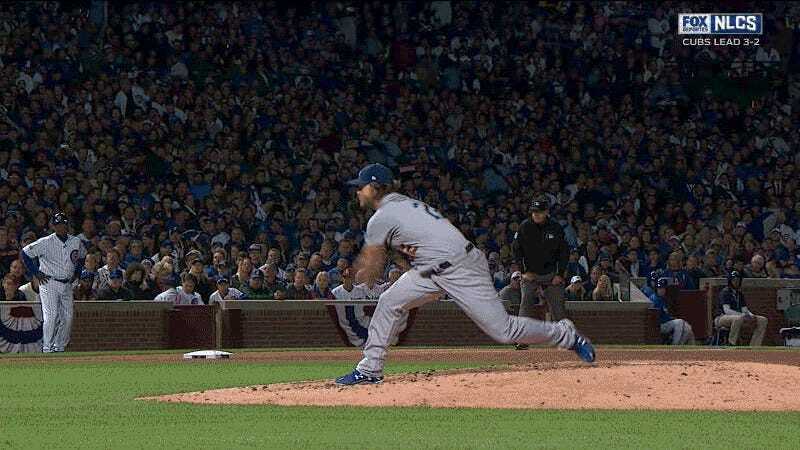 In a Game 2 precursor between Kershaw and Hendricks, the Cubs starter lasted just 5 1/3, taking the loss in a 1-0 game. But tonight Hendricks was almost unhittable. He left after 8 1/3, with a man on first, having given up just two hits and no walks on 88 pitches. Aroldis Chapman completed the final five outs—including a double play to end the eighth and keeps the Dodgers’ plate appearances to a minimum—and the 103-win Cubs are one step closer to losing the sympathy of non Chicagoans around the country. Tuesday is Game One of the Tortured Fan Base (and don’t you forget it!) World Series between the Chicago Cubs and the Cleveland Indians. Are You Ready For The Flood Of Bad Writing About The Cubs?